I want to do a Full Outer Join in MySQL. Is this possible? Is a Full Outer Join supported by MySQL? You don't have FULL JOINS on MySQL, but you can sure emulate them. Actually the thing you wrote is not correct. Because when you do a UNION you will remove duplicates, and sometimes when you join two different tables there should be duplicates. @NikolaBogdanović: there certainly is a difference if what you are joining on is not a unique key. say t2 had two rows with the same id and t1 had zero or one row with that id; your UNION query only gives one row of results; the correct query SELECT * FROM t1 LEFT JOIN t2 ON t1.id = t2.id UNION ALL SELECT * FROM t1 RIGHT JOIN t2 ON t1.id = t2.id WHERE t1.id IS NULL gives two. and I see now that you say that yourself, sorry. Perhaps you could update your answer, given there is this case that it gets wrong and that the UNION ALL is always going to be more efficient? @PavleLekic Your criticism is valid, but your 'correct' example is unclear (how do we choose which column to check for NULL in the WHERE clause?) and still fails to perfectly emulate an outer join. For example, it can fail if you have an eccentric join condition, like joining on all the columns of both tables being null. create table t1 (id int); create table t2 (id int); insert into t1 values (1); insert into t1 values (1); Then the correct result has two rows. This solution with UNION removes duplicates, i.e. it doesn't work correctly in all cases. @ypercube: If there no duplicate rows in t1 and t2, the query in this answer does return a resultset that emulates FULL OUTER JOIN. But in the more general case, for example, the SELECT list doesn't contain sufficient columns/expressions to make the returned rows unique, then this query pattern is insufficient to reproduce the set that would be produced by a FULL OUTER JOIN. To get a more faithful emulation, we'd need a UNION ALL set operator, and one of the queries would need an anti-join pattern. The comment from Pavle Lekic (above) gives the correct query pattern. How do you combine this with an ORDER BY? It is complaining that I can't use those tables in my global ORDER. I figured it out. I just had to only use the column names instead of the table name and column name in the ORDER BY. @PavleLekic At least on my system, a UNION ALL always creates extra duplicate rows even if the two tables do not have any duplicates and enforce that through primary keys. You always need to use UNION without the ALL if you want to get unique rows. This makes sense if you just think about what UNION and UNION ALL do without thinking about trying to emulate a full outer join. To illustrate this, in the case where every row just happens to have a matching row in the other table (matching as in the id field used for the on clause is the same), UNION ALL will select twice as many rows as UNION. if t1 and t2 are anonymous queries, is there a way I can format this query without having to repeat the select for t1 and t2? Now, there is no harm in writing the original query as is, but say if you have predicates like the WHERE clause, which is a before-join predicate or an AND predicate on the ON clause, which is a during-join predicate, then you might want to take a look at the devil; which is in details. MySql query optimizer routinely checks the predicates if they are null-rejected. Now, if you have done the RIGHT JOIN, but with WHERE predicate on the column from t1, then you might be at a risk of running into a null-rejected scenario. So the order of tables has changed, but the predicate is still applied to t1, but t1 is now in the 'ON' clause. If t1.col1 is defined as NOT NULL column, then this query will be null-rejected. Any outer-join (left, right, full) that is null-rejected is converted to an inner-join by MySql. Thus the results you might be expecting might be completely different from what the MySql is returning. You might think its a bug with MySql's RIGHT JOIN, but thats not right. Its just how the MySql query-optimizer works. So the developer-in-charge has to pay attention to these nuances when he is constructing the query. The SQL standard says full join on is inner join on rows union all unmatched left table rows extended by nulls union all right table rows extended by nulls. Ie inner join on rows union all rows in left join on but not inner join on union all rows in right join on but not inner join on. Ie left join on rows union all right join on rows not in inner join on. Or if you know your inner join on result can't have null in a particular right table column then "right join on rows not in inner join on" are rows in right join on with the on condition extended by and that column is null. Ie similarly right join on union all appropriate left join on rows. what'd you say about Cross join solution? No, this is a cross join. It will match every row in t1 to every row in t2, yielding the set of all possible combinations, with select (select count(*) from t1) * (select count(*) from t2)) rows in the result set. While this code may answer the question, providing additional context regarding how and why it solves the problem would improve the answer's long-term value. Which addition may be helpful? maybe en example? Note: This may be the best solution, both for efficiency and for generating the same results as a FULL OUTER JOIN. This blog post also explains it well - to quote from Method 2: "This handles duplicate rows correctly and doesn’t include anything it shouldn’t. It’s necessary to use UNION ALL instead of plain UNION, which would eliminate the duplicates I want to keep. This may be significantly more efficient on large result sets, since there’s no need to sort and remove duplicates." I suggest you to use some temporary tables ;). This method seems to be the best solution, both for efficiency and for generating the same results as a FULL OUTER JOIN. This blog post also explains it well - to quote from Method 2: "This handles duplicate rows correctly and doesn’t include anything it shouldn’t. It’s necessary to use UNION ALL instead of plain UNION, which would eliminate the duplicates I want to keep. This may be significantly more efficient on large result sets, since there’s no need to sort and remove duplicates." @SteveChambers it's too late, but thanks for your comment. I added your comment to then answer to highlighted more, If you are not agree please roll it back ;). No problem @shA.t - IMO this should really have more upvotes and/or be the accepted answer. No, this is a type of "outer-only" join, that will only return the rows from tablea that don't have a match in tableb and vice versa. The you try to UNION ALL, which would only work if these two tables have equivalently ordered columns, which isn't guaranteed. That's not an outer join. An outer join also includes the matching members. Using a UNION or UNION ALL answer does not cover the edge case where the base tables have duplicated entries. The order is different, but otherwise matches the correct answer. That's cute, but misrepresents the UNION ALL solution. Also, it presents a solution using UNION which would be slower on large source tables because of the required de-duplication. Finally, it wouldn't compile, because the field id doesn't exist in the subquery tmp. I never made a claim about speed, and neither did the OP mention anything about speed. Assuming the the UNION ALL (you don't rely specify which one) and this both give the correct answer, if we wanted to make the assertion that one is faster, we would need to provide benchmarks, and that would be digressing from the OP question. As to the observation about the id not being in the sub-query, I corrected the typo - thank you for pointing it out. Your misrepresentations claim is vague - if maybe you could provide more information, I can address that. On your final observation about cuteness, I don't have any comment, I would rather focus on the logic of the sql. Misrepresents: "The UNION ALL solution: ... Is also incorrect." The code you present leaves out the intersection-exclusion from the right-join (where t1.id1 is null) that must be provided in the UNION ALL. Which is to say, your solution trumps all the others, only when one of those other solutions is incorrectly implemented. On "cuteness," point taken. That was gratuitous, my apologies. None of the above answers are actually correct, because they do not follow the semantics when there are duplicated values. If you need for this to work with NULL values (which may also be necessary), then use the NULL-safe comparison operator, <=> rather than =. this is often a good solution, but it might give different results than a FULL OUTER JOIN whenever the name column is null. The union all query with anti-join pattern should reproduce the outer join behavior correctly, but which solution is more appropriate depends on the context and on the constraints that are active on the tables. @fthiella . . . That is a good point. I adjusted the answer. yes the accepted answer is wrong, as a general solution I think it's correct to use union all, but that answer misses an anti-join pattern in either the first or the second query that will keep existing duplicates but prevents from adding new ones. Depending on the context other solutions (like this one) might be more appropriate. The answer that Pablo Santa Cruz gave is correct; however, in case anybody stumbled on this page and wants more clarification, here is a detailed breakdown. Inner joins don't have a direction (like left or right) because they are explicitly bidirectional - we require a match on both sides. Outer joins, on the other hand, are for finding records that may not have a match in the other table. As such, you have to specify which side of the join is allowed to have a missing record. LEFT JOIN and RIGHT JOIN are shorthand for LEFT OUTER JOIN and RIGHT OUTER JOIN; I will use their full names below to reinforce the concept of outer joins vs inner joins. You can think of a UNION as meaning "run both of these queries, then stack the results on top of each other"; some of the rows will come from the first query and some from the second. On the other hand, if you wanted to see duplicates for some reason, you could use UNION ALL. 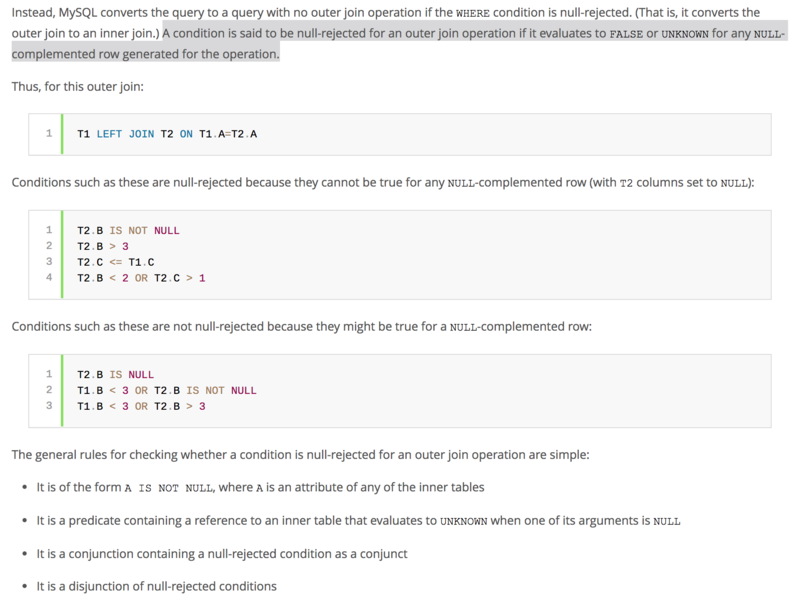 For MySQL you really want to avoid using UNION instead of UNION ALL if there is no overlap (see Pavle's comment above). If you could add some more info to that effect in your answer here, I think it'd be the preferred answer for this question as it's more thorough. The recommendation from the "database guru colleague" is correct. In terms of the relational model (all the theoretical work done by Ted Codd and Chris Date), a query of the last form emulates a FULL OUTER JOIN, because it combines two distinct sets, The second query doesn't introduce "duplicates" (rows already returned by the first query) that would not be produced by a FULL OUTER JOIN. There's nothing wrong with doing queries that way, and using UNION to remove those duplicates. But to really replicate a FULL OUTER JOIN, we need one of the queries to be an anti-join. Jeff Atwood's post does a really good job of visually explaining join types with Venn diagrams. And, he gives an example of the anti-join... returning rows from A that are not in B. And we can visually see how this set is distinct from the set of all rows in B along with matching rows in A. @NathanLong your post here is old but man it is an awesome little piece of clarification and instruction. well written and examplefied! Awesome. @spencer7593, can you explain more as to why we need what the guru colleagues recommend i.e. the where clause in the second select query WHERE `t1`.`id` IS NULL;? @IstiaqueAhmed: the goal is to emulate a FULL OUTER JOIN operation. We need that condition in the second query so it returns only rows that don't have a match (an anti-join pattern.). Without that condition, the query is an outer join... it returns rows that match as well as those without a match. And the rows that match were already returned by the first query. If the second query returns those same rows (again), we've duplicated rows and our result will not be equivalent to a FULL OUTER JOIN. @IstiaqueAhmed: It is true that a UNION operation will remove those duplicates; but it also removes ALL duplicate rows, including duplicate rows that would be in the returned by a FULL OUTER JOIN. To emulate a FULL JOIN b, the correct pattern is (a LEFT JOIN b) UNION ALL (b ANTI JOIN a). @spencer7593, including duplicate rows that would be in the returned by a FULL OUTER JOIN - can you explain it more ? Very concise answer with a great explanation. Thanks for this. It is also possible, but you have to mention the same field names in select. This is just duplicating the results from a left join.